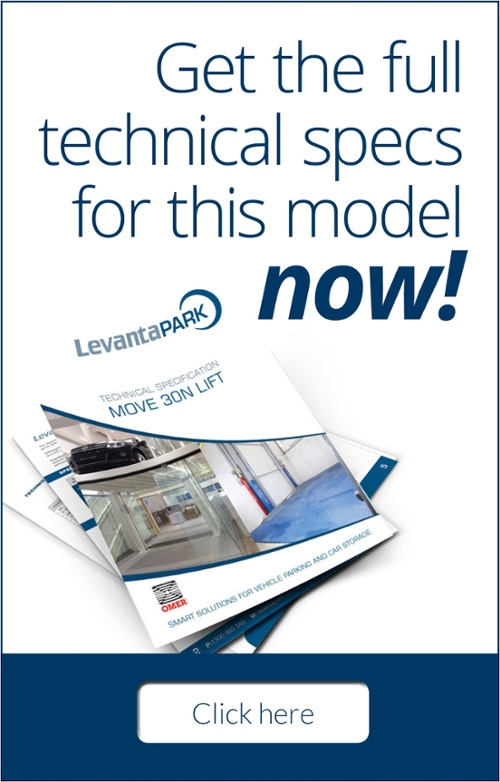 The Move 30N car parking lift operates with a two column system, with the columns placed on opposite sides along the longer sides of platform. While Move 30N must be attached to walls on either side, it doesn’t impose the same loads as the Move 30L, and can double as both a car parking lift and a goods lift. Move 30N’s platform runs on two opposing columns that are easy to install, even where space does not allow for direct securing to walls. The vehicle can be parked on the Move 30N platform facing in either direction, without affecting the platform balance at all. The platform is certified for use up to a height of 11 metres. The platform is composed of an extremely resistant base structure and no points are subject to bending even though the weight bearing capacity of 3 tonnes. Move 30N’s stability makes this lift extremely safe and easy to drive the vehicle onto the platform. Move 30N’s torsion bar system prevents the vehicle weight from putting the platform out of balance, and ensures greater safety while the platform is moving. Importantly, because the torsion bar slides on a rack (which is a self-contained element), it doesn’t affect the column structure. An important safety feature is the mechanical system which locks the platform to the floor. Operated by a hydraulic piston, it ensures perfect platform safety, connecting the shoulder to the piston and preventing untimely movement while the vehicle is being parked on the platform itself. What’s more, when the connection is made, the entire hydraulic system can be set at rest, safeguarding it and extending its lifespan. Detail of Move 30N’s floor level mechanical locking device. If required, Move 30N allows you to add fixed or mobile protection guards directly on the platform, thus ensuring greater safety while the vehicle is being moved. Move 30N comes complete with shims/beams to secure it to the nearest wall, ensuring the utmost stability and safety. Move 30 N’s piston and chain (at a ratio of 1:2), allow the travel vs. the length of the shaft to be doubled. The top of the piston holds a pulley over which a chain slides. It’s protected by a metal plate which prevents the chain from leaving its housing. Move 30 N has different limit switch systems. The stop limit switch stops the platform at the level indicated, ensuring it is safe to embark or disembark. Crucially, another limit switch ensures that the platform arrives at the desired level gently, without any abrupt movement. The Move 30N management and control assembly is quite compact and takes up very little space. The electric motor is installed over the oil tank and the electrical panel is installed to the side, allowing for quick, easy access for functional maintenance.